This grand villa has been equipped to the highest standard offering quality furnishings throughout. It has been thoughtfully equipped to cater for all your holiday needs. From board games and swimming towels to fine glasses and quality furnishings. Everything you require for your luxury break is provided. The villa offers stunning views from all terraces, being open plan along with floor to ceiling windows, ensures a view of the sea from anywhere inside. Watch the sunset from the villa terrace or down by the pool. Pool area offers showers and drinks fridge. Air-conditioning and mosquito nets throughout. Beautifully kept gardens on two levels. Situated by the beach and only a short walk to the harbour and local amenities including shops, restaurants serving locally caught fish. The villa offers a spectacular location with stunning views of Gulluk Bay, Bodrum Peninsula. Just a hard working middle-class person……..
En-suite comprises of double basins, wc and deluxe roll top bath free standing, with over head shower. Family bathroom, Walk in wet room, basin and wc. Washing machine. Open plan downstairs sunken lounge area, sofas, coffee table, TV, DVD player, CD player. Dining area with table to seat 6, matching furniture throughout. Unspoilt sea views from all windows, double sliding doors to both terraces. Fully fitted kitchen, oven and hob, dishwasher, fridge, freezer, toaster, sandwich maker, Mircowave, water cooler. Granite worktops. Fully equipped to cater for family. Sliding doors to side garden and barbecue. The new Vita Park Golf course opened July 2008 15 minutes drive. Details available upon request. Notes on accommodation: This is a fantastic fully equipped villa for either a family holiday or romantic retreat. Large property on terraced grounds, private pool, grassed garden areas complemented with palm trees. Air-conditioning/warm air heading. No smoking inside villa, please. Outside: Various garden areas set on 2 levels. Villa level has pretty grass and planted areas, lounge and dining room terrace with selection of high quality furniture. Large 'outback' barbecue. Steps leading down to pool area, large family pool, outdoor shower and drinks fridge. Cleaning / Towels / Linen / Maid service: Villa cleaned weekly, pool and gardens maintained. Linen, towels and pool towels provided. Extra cleaning available locally for small charge. Other: Magnificent granite spiral staircase, leads up to gallery landing which overlooks lounge. Cloakroom and storage cupboards. Family villa providing board games, books, DVDs and CDs, PSP charger for use during your stay. We have just returned from 2 weeks at Hugeview villa. The accommodation is first class - it is a beautiful villa, well equipped with fantastic views over the bay enjoyed from the wonderful balcony, private gardens and pool. Perfect for a relaxing, peaceful break. The owners local contact also proved very helpful, always being on hand to help with local information etc. Gulluck village is a reasonable walk from the villa; bearing in mind the heat, we preferred to use taxi's which were cheap and very easy to organise. It is a quite village but there is a decent selection of restaurants which were all good and excellent value. We also went on a boat trip from the harbour which was great fun. I would happily recommend this villa for a relaxing family holiday; my wife, 2 daughters and I had a great time. The owner and his local contact were a pleasure to deal with. Stayed here beginning on May with my partner for a weeks break. We had a fantastic time. The villa itself is beautiful with all the furnishings done to a high standard and with sea views, couldn't fault it! Everything we needed was within close proximity so we had no problems. I will be going back! Gulluk is the perfect get away location, with the local village boasting true Turkish culture, enjoy a stroll along the harbour, enjoy fresh fish from numerous restaurants, sample local Pide, (Turkish Pizza), or freshly made ice cream from local parlour. Daily boat trips to enjoy the coast. 2 Large supermarkets, bank and local shops. Regular buses to local towns. Walking distance to many small beaches. Village bus runs along the coast of Gulluk, for journeys into the village, 5 minute ride. Local buses to all areas including Bodrum, Milas, Izmir and Istanbul. Local taxis. Gulluk village 1 mile. Small grocery store near to villa selling all daily needs. Able to walk to local village (good restaurants,bars and shops) and Med Inn hotel with excellent food near by. Most locals can speak English. Booking Notes: 20% deposit on booking and balance 8 weeks before departure. £250 damage deposit. 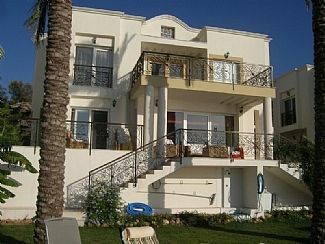 When renting the villa the price includes free transport to and from Bodrum airport. Free wi-fi and a welcome pack will includes large bottle of water which should last you around a week. In the fridge you will find coke, wine and larger to start you break. Changeover Day: We will do our best to accommodate your needs. Notes on prices: This includes free airport transport from Bodrum airport, wi-fi, large bottle of water and welcome pack in fridge.